COLIN Friels has fought many battles—both on and off screen—but today’s adversary has crossed the line. He’s black, feathered and eyeing off Friels’ strawberry patch. “He’s incredible,” Friels says of the cheeky currawong that has taken up residence in the actor’s back yard. The 52-year-old actor is relaxed and clearly enjoying nature’s spoils. It is a far cry from the troubled man in the headlines several years ago. In 1997, at the height of his Water Rats fame, Friels was diagnosed with pancreatic cancer and underwent seven months of chemotherapy. The same year, he allegedly threatened a Sydney bus driver and in 2002 his wife, actress Judy Davis, took out an apprehended violence order against him after a domestic dispute. Fortunately, the only drama in Friels’ life these days is scripted. On Sunday he returns to the small screen as Detective Jack Kempson, the whistle-blowing cop who pursues unsolved crimes after being banished to the computer records section of police headquarters. It is the first of three highly anticipated BlackJack telemovies and another trio has been ordered for next year. While Friels is full of praise for the writers, cast, and director Peter Andrikidis, he can reveal little else about the latest instalment in the series. It seems an odd statement for someone who has won two AFI awards, a Logie, countless theatre accolades and is considered one of the country’s finest performers. But Friels is no ordinary actor. He constantly downplays his talent, frequently referring to his age (“I’m older and uglier, no doubt about that”) and finds it incredible that he gets parts, let alone is offered them. He even apologises to the audience in advance in case they do not enjoy his performance. “Hopefully there’s a bit of a forgiveness factor,” he says. 1952: Born in Glasgow, Scotland. Moves to Australia at the age of nine. 1976: Graduates from NIDA. His fellow students included Mel Gibson, Dennis Olsen and Judy Davis. 1984: Marries actor Judy Davis. They have two children. 1986: Won an AFI Award for his role as the slow-witted inventor in Malcolm. 1997: Suffered from pancreatic cancer and nearly died. He is in full remission. 2002: A Sydney court orders Friels not to “assault, harass, or otherwise threaten” Davis, following a domestic dispute. Friels does not think much of the current film industry, saying “the bar’s pretty low here at the moment” and is not a big television fan either. But he does confess to liking US mob drama The Sopranos. “I thought it was fantastic. Superb casting and fascinating sort of scripts, not remotely condescending,” he says. But Friels is quick to stress he has no intention of jumping ship. Friels was born in Scotland and migrated to Melbourne with his family as a young boy. He worked as a brickie’s labourer before enrolling in NIDA in the mid 1970s. He went on to establish himself as a talented stage performer, but it was his AFI Award-winning role in the 1986 film Malcolm that really caught the attention of the industry. Other great films followed, including Kangaroo, Angel Baby, Cosi and most recently, Tom White. 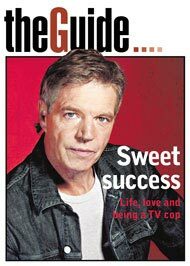 In 1996 he joined Nine’s Water Rats playing Detective Frank Holloway until his cancer treatment forced him to leave. Friels says he was ready to exit the popular drama and would never do a weekly series again. “It’s too hard. You sort of go a bit brain dead,” he says. But it has not turned him off television all together, saying he prefers short stints like BlackJack to making movies. To keep himself occupied, Friels often pops into the Gabba during the AFL season to watch his favourite team, the Brisbane Lions. “Leigh Matthews is a genius. If we could have a few actors like him, we’d be laughing,” he says.